Pappi – Haunt presents pack of 20 sports digital multifunction 7-light display smart wrist watch for kids, children. 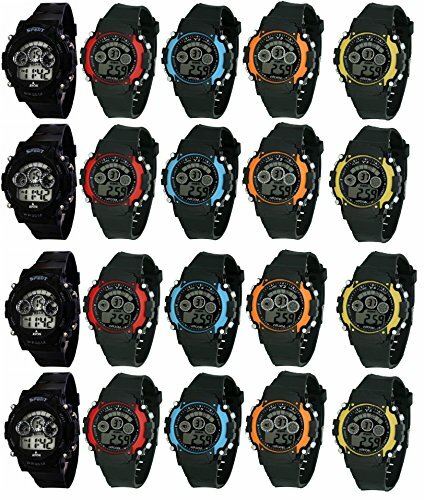 This pack of 20 sports watches can be used as BIRTHDAY PARTY RETURN GIFT for kids, children. Best for Kids.Kids will definitely love it.Wrist watch is UNISEX.Pack of 20 – 7 Light Trendy Display Sports Digital Wrist Watch for Kids, Children, Boys & Girls.BEST FOR BIRTHDAY PARTY RETURN GIFTS for Boys & Girls. Fully Tested before Dispatch, QUALITY ASSURANCE.Each Watch comes in Individual Poly pack.